I told Teeny she has pretty lips. I told her it makes me wanna kiss her. I have been wearing flats a lot recently. My mom (with the funny bauble bangle) was holding up her mobile phone, for Jing, who was on the line. Jing all the way in Australia. Flushed after 3 glasses of red wine. I have a geeky smile when I am slightly tipsy. I wore this on 2nd day of CNY. I am trying to wear bright colors for the sake of festivities. Me: Err, you mean mushrooms? Me: Err you mean FUNGHI??? After Teeny and I have established to my auntie and uncle that NO we are not getting married anytime soon,. they turned their attention to my brother. My 14 year-old brother who is taking PMR this year. "Boy, do you want daddy and mommy to get you a young wife? Last time in our kampung, boys who are 15 or 16 can get married already lor!" HHAHAHHAHAHHA. Watching my kayu brother squirmed in his seat, and seeing a myriad of expressions on his face (shy/confused/nervous/wants to laugh) makes my day HAHAHAHA! Teeny trying to convince me that her burnt chocolate chip cookies are black because she used brown sugar. Met up with Bernard yesterday with Mey and Smalls. We were chatting online today, and I apologised to him: "Sorry that we were so noisy yesterday, hope the three of us didn't scare your girlfriend!" And he replied me, "No wor, compared to last time, you guys are very quiet"
Smalls fished out her Clinique anti-blemish concealer, and I squealed, "I use the same one!" Mey peeked over in interest, so Smalls handed the tiny tube for her to try. "Mey? Why are you putting concealer on your hand??" "I have a tiny pimple on my hand!!" As we were nearing my house in the car last night, my mom was practically bouncing in her seat, "I can't wait for you to see the house!". Teeny muttered to me under her breath, "Don't get shocked". I stood at a side, luggage still in hand, while my mom begun to describe every little story and background behind the satin lanterns, the blooming chrysanthemums, the dangling ornaments. Red nails for CNY. Caught in the rain. Teeny being all kung-fu with the borrowed umbrella. Brown Russia. Bright colors. I do not have a hawk nose, do I? Spoon swallower. Teeny's upcoming hairstyle. Got milk? I still need something red for CNY. I don't think I have ever traveled so far just for ice cream before! Had one of the nicest breakfast food I have had in a long time...for dinner wtf. Latte, white wine and water. 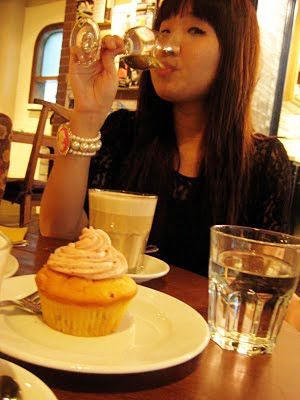 White wine for the smoked salmon in our brekkie dishes, and latte for the abundance of desserts that we ordered! We both simultaneously agreed that girls should never control themselves when it comes to food. "I just want to find someone who will grow old with me and dance with me on the streets..."
New updates on Boudoir Boudoir!